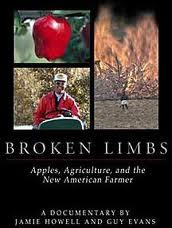 Today I watched the documentary, Broken Limbs, once again. I always show it in my food ethics class. It is important to show because it puts a face on sustainable, local agriculture. Made a few years back by a Wenatchee, WA native, it is about the apple industry in Washington state and how it has changed in a single generation. 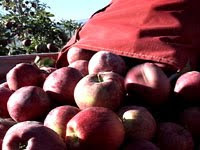 It used to be that in Wenatchee, dubbed "the apple capital of the world" a five acre orchard could support a family and now that is unusual. Farmers are pulling out apple trees because they just don't pay the bills anymore. They have to try something new, something different if they are to stay small and stay in business. Students usually respond positively about the film and not only because many of them are from the Wenatchee area or know someone who is (this year one student said that if the footage had been from the 2004 instead of 2003 Apple Blossom Parade she would have been on the float). But since it is local to us here in Washington state I do think it hits home in a different sort of way. I grew up on the East coast knowing about Washington apples and believing they were good apples. When I first moved to Washington state and heard the governor on the news talking about trade agreements with New Zealand which included apples I thought it was pretty silly. Aren't apples naturally something that can be held over the winter? Or at least a good chunk of the winter? A new crop apple in February is something you know isn't locally grown around here. There are two parts of the film that touch my heart every time I see it. When the farmer, losing his land, talks about how hard it is as his wife tears up and when the man making the film starts to help his dad on his land and to see the importance of farmer. He describes himself as the broken limb, since he did not want to go into the orchard like his father, grandfather and great-grandfather. And there are two parts that give me hope every time I see it, too. When Ikerd, who is interviewed explains the purpose of agriculture--to make people's lives better and the triple bottom line of sustainable agriculture--that is needs to be sustainable for the environment, for the farmer (i.e., profitable) and for the people in the community and when small farmers who are sustainable are interviewed and say that they are happy to share what they know with others. Being able to eat ethically once again is something that starts slowly. It used to be the only way to eat--there weren't big businesses involved as there are today. This isn't to say all business is bad, but that once we became disconnected from the food system we eat in, eating unethically, because we ate unknowingly became a possibility. 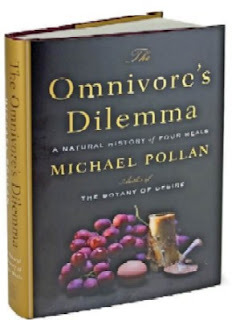 As people try to get back to methods that are sustainable and eaters demand that of their food system we have hope that we can, bite by bite, make a better choice and a better world. My apple a day will be a Washington apple for as long as I live here--that's my bite into the better world. So tonight I cooked with 11 undergraduates. We made a close to vegan pizza and peach crisp served with fair trade organic earl grey iced tea. Am I crazy for doing this? This is the third time teaching my ethics of eating class and so the third time cooking. This was, by far, the smoothest time. In fact, the getting all the items together from my home kitchen to the kitchen in the department building was so easy that I thought for sure I had forgotten something really necessary. Nevertheless, three students who had never made bread helped make the whole wheat pizza dough and many were surprised how quickly the yeast got to work and that bread dough rose. 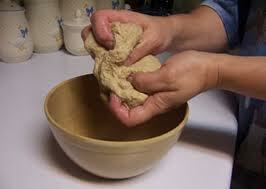 Seeing bread rise is impressive in itself on an ordinary day, but today was pretty warm and things really went fast. We covered the pizza dough with crushed organic tomatoes, some salt, crushed red pepper flake, basil, oregano, some rice milk "cheese" (which did have a little milk protein in it, hence the close to vegan bit), onion, zucchini, pepper and black olives. 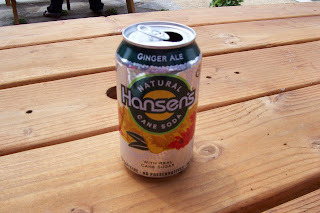 Most of the ingredients were local and organic, some just organic, some just local. Same goes for the ingredients in the crisp. 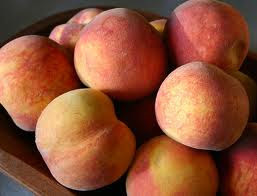 Local organic peaches, local oats, organic local flour, organic brown sugar and cinnamon. Baked for 25 minutes the peaches released their juices and it was lovely even without adding any sugar to the fruit itself. Everyone ate, laughed, talked. Everyone worked, too. Eating in community is one of my food values. And it is for many of my students who often lament that in their busy lives they usually eat alone. This is a class period I always look forward to. There is always something I learn about my students and some things they learn about me. This is experiential learning and really personal learning, too. Plus, it seems a cruel joke to teach and ethics of eating class and not at least once eat as a class! A pizza party is a fitting part of such a class. We're getting to the end of the content for the class. Just three sessions left--one will be a video and a simulation about food access, another their paper presentations and the last the final exam. The end of the summer session and closing out another ethics of eating class is always bittersweet for me, since I love the topic so and learn so much myself. I am already planning new and different things for next summer's class and their pizza party. As my Italian grandmother says, "Mange, mange!" A few times a year I get a craving for a hamburger that cannot be ignored. Sometimes I get a craving and if I put it off for a few days it goes away. But not this time. For the last few days I really have wanted a hamburger. 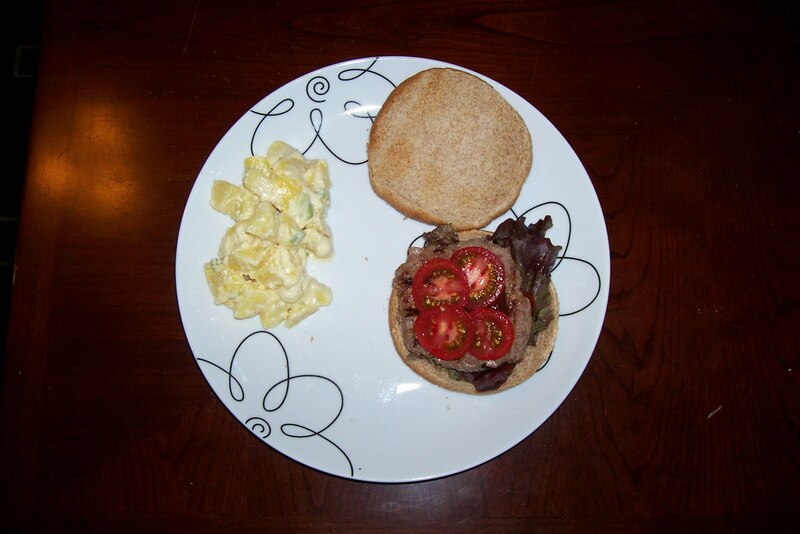 Nothing fancy--just a regular sort of hamburger. Well, regular in some respects. I guess that in many respects my hamburger was anything but ordinary. It was grass-fed beef from a ranch/farm about 70 miles from where I live. And I know, not well, but I do know, the people who raised it. Nothing that cow ate wasn't grass on their land or hay or potatoes (in the winter) that they grew on their land. No hormones, no antibiotics either. 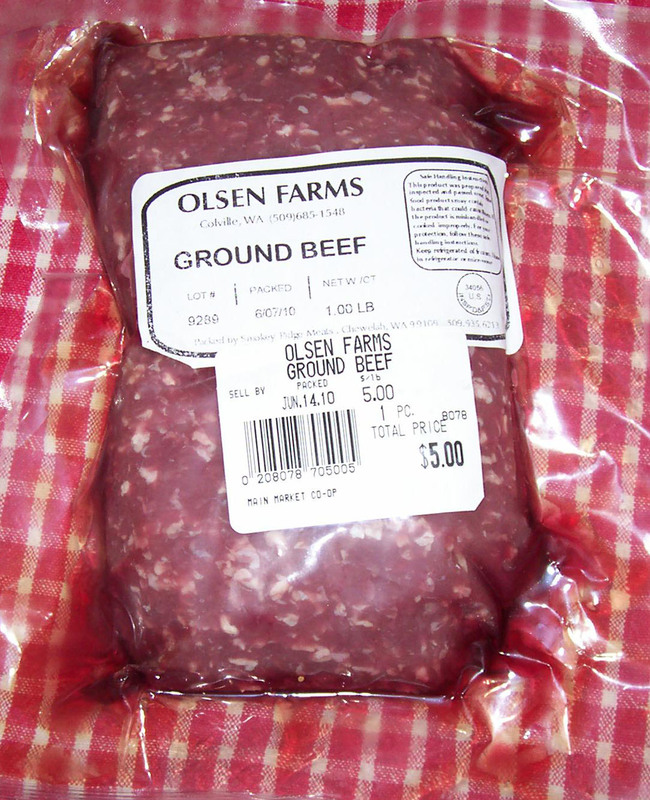 This is real pastured beef. There is some good scientific evidence that grass-fed beef (rather than grain fed) is better for you health-wise and there is little disputing that it is better for the cattle and better for the environment, too. It might be a little pricier than factory farmed ground beef, but that's an extra dollar or so a pound that I am willing to pay and I know what it goes for. If you think about it, it really isn't a lot of extra money for the extra space the cattle get, the access to a much more normal life for cattle and for the farmers who do the work to make this possible. In fact, an awful lot of my lunch today came from that same farm. I have been buying potatoes from Olsen Farms at the farmers market for years now. They grow dozens of interesting varieties with interesting colors. And I am still eating the potatoes I bought last fall to hold over the winter. I had been thinking I had better get through them fast since new potatoes are showing up at the market, so yesterday I made potato salad. Their potatoes are interesting and tasty. These were German Butterball potatoes that I boiled up. They make great mashed potatoes, too. There is a variety for just about every purpose. Occasionally when I am feeling patriotic I will make fries with red, blue and white potatoes just for kicks. And that's only possible because of the varieties from Olsen Farms. 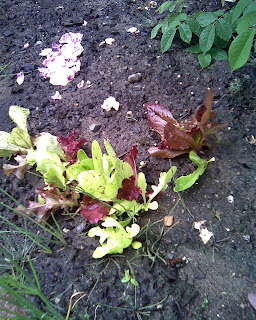 And the lettuce on the burger was bought yesterday at their farmers market stall, too. It was such a pretty head of red leaf lettuce I bought it even though I already had bought a head of green leaf lettuce at another favorite stall of mine. This is one of the great things about eating local food. 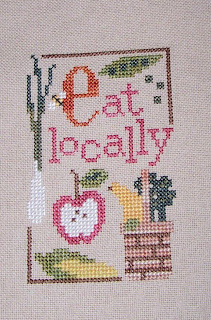 Through eating, which I am going to do anyway, I can support local farmers, who in turn give me something else I want -- access to information about the food I eat. They say knowledge is power, and here I see evidence that it is. I had to quickly water the garden tonight en route to a going away party for one of the priests on campus. As the late afternoon heat really got under way, I watered the plants in the garden in the midst of a lot bees working diligently on the blossoms that will soon be raspberries. 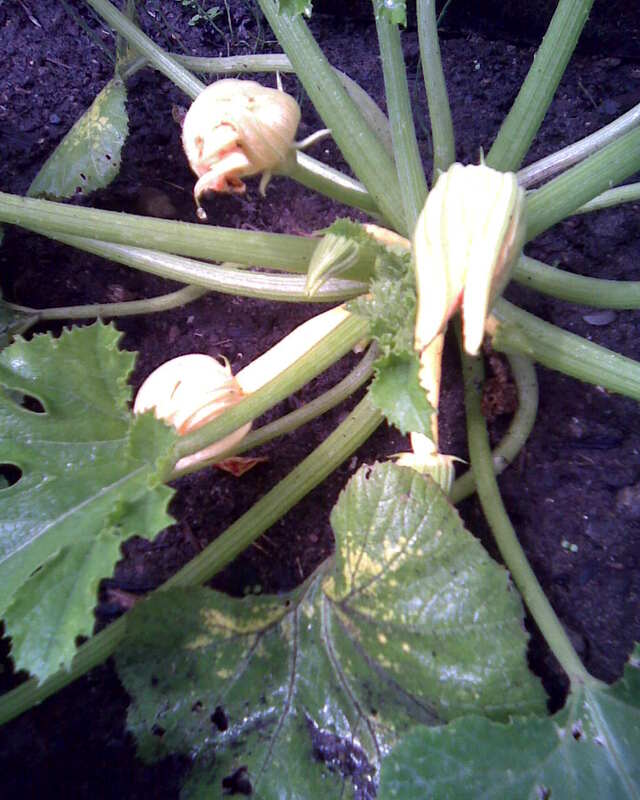 The flowers on the remaining two cucumber plants (of the seven I planted) were the first bright yellow surprise. 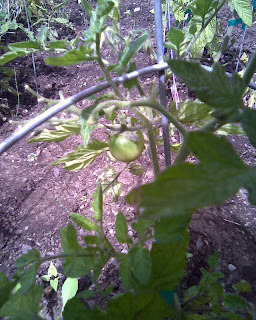 And then, after the hose had been turned off I made my inspection of the plants--what was looking good, better than last time, or not as good as last time--and I saw them, two bright yellow golden nugget cherry tomatoes. I plucked them right then and there and ate them then and there, too. Still warm from the sun, they were sweet and had a bright, fresh tomato taste. There promise to be some more of them in the days to come and green tomatoes are setting in on many of the plants. It truly is a summer miracle. I am two-thirds finished teaching my summer school classes this year. It always fly by. Those six week condensed sessions make even the three hour sessions seem a little too quick. My students in my ethics and eating class have started talking to me about the paper and presentation topics. There are sure to be some interesting things covered. From composting to bottled water to freeganism. And we are getting to the part of the term where things are getting a little more hands on, too. Thursday we took a trip to the Main Market Co-op and had a great tour of the place by Jeannette Hamilton the store manager. As an occasional volunteer there I had been on the tour already, but I learned some new things myself. And I was even surprised by how many obvious connections there were between what is going on at the co-op and class discussions. We talked about local farmers, dairy and egg production, the vast bounty that is available to us from our local region, relationship coffee as a step even beyond fair trade, and humane meat production. I am surely going to borrow the line from Jeannette when she said that the meat carried by the co-op was raised humanely -- the animals just had "one really bad day." Tuesday is the day we cook as a class. We are going to make vegan pizza and some fruit crisp. I did some of the shopping for class today at the farmers market and the co-op. I intentionally decided when teaching this class for the first time that cooking together would be an important thing to do and making a vegan meal was also. Too many people think you can't eat a "normal" meal as a vegan. And the only "mock" food we'll use is some vegan "cheese" for the pizza. The food is pretty much ethically sourced from local markets and stores and will be cooked by all the students in the class, me, and a special guest--one of the Main Market Board of Directors, Kyle West. This is a lot of students' favorite class session. As we cook, chop, slice, bake and wait for the pizza dough to rise, we are going to talk about food miles, canning, eating local, and getting back to the communal aspects of food. Ethical food is good food and when shared is even better. I look forward to this class session, too. I have been told I am brave to give sharp kitchen knives to undergraduates and to eat what they helped cook. That might be so. But it is a brave new world we are looking into, one where even the average undergraduate thinks carefully about his or her food, chooses wisely and ethically, and is ready to share with others in the community. From the bounty of the strawberries I picked last week, I have done some baking. First, just a good old standard strawberry rhubarb crisp. 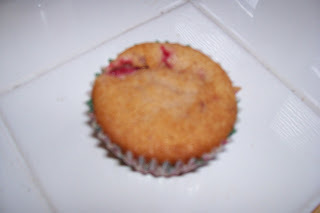 But last night I ventured to strawberry muffins. The muffin recipe in my old McCall's cookbook (which is from the 60s, and includes lots of odd recipes for the average housewife of that era and contains some that use pre-packaged ingredients that don't even exist any more) isn't great, so I had to venture out. The internet has so many cooking websites with so many recipe collections that there had to be one out there that was good. I read about 20 recipes before I settled on one. And that in itself might have been the mistake. After reading so many recipes and thinking about using as local and as ethical ingredients as possible, I made a few adjustments to the recipe I settled on. And, well, those of you who bake know that baking is as much a science as it is an art, and chemical processes give only so much. I ended up with some very tasty muffins, most of which, if they rose, fell. The recipe clearly needs some tweaking. And thankfully I still have several pounds of strawberries with which to experiment. But I think it is important to note that I do not think using local ingredients as much as possible here had anything to do with the "failure" of this recipe. The local flour is still flour, the local, free range eggs are still eggs, for example. It's a matter of getting proportions and heat and timing right. If it isn't, then I will have to find a new recipe altogether that works well with the ingredients I am willing to use. 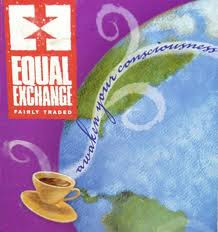 I'd rather find a new recipe than compromise the ethics. 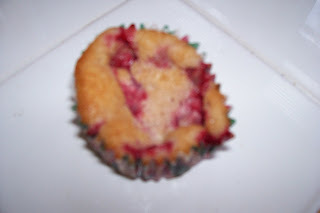 And even if I end up with kind of ugly muffins, I know that they are good where it counts--the ethics and the taste! I'll post the better of the two recipes later and let everyone know if further adjustments are needed. Many of the people there were picking with children. 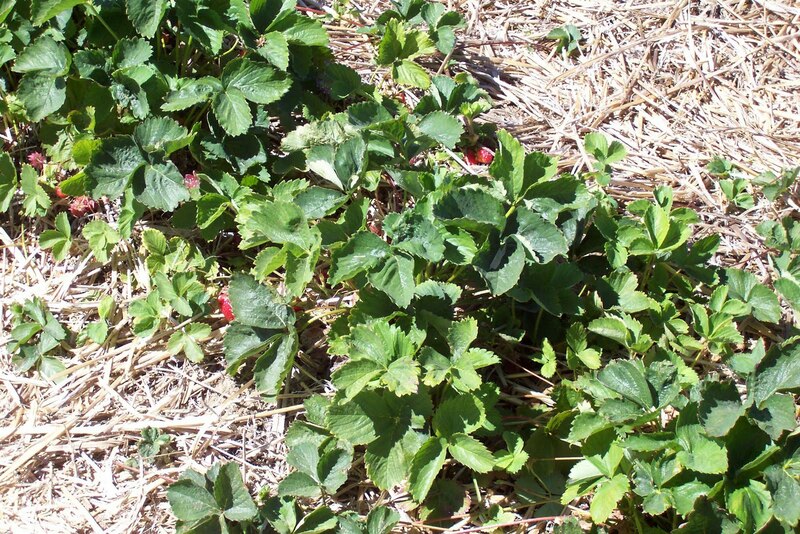 It is good to see kids on the farm looking at the strawberries, the ponies, the plants that will yield the fall pumpkins that will be their jack-o'lanterns. It will make nice memories for them, I hope. I hope also that it will mean they have some sense of where their food comes from. It's the freshest food around--I know exactly when it was picked--between 10:15 and 11:15 this morning. 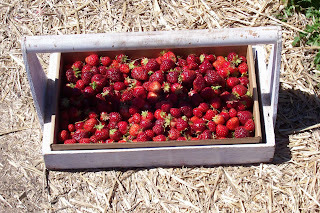 And in that hour I picked about 7 pounds of strawberries which was about 2/3 of one planted row. I have a raw spot on my left palm from the scratches the straw between the rows and plants made. And I missed a spot on my upper arm when putting the sunscreen on. Small prices to pay. And the price for the berries themselves was pretty small too. At 99 cents a pound it is a great deal. On my walking back from the fields to pay for the berries I noticed that you could probably just walk away without paying. But that would be a crime twice over. 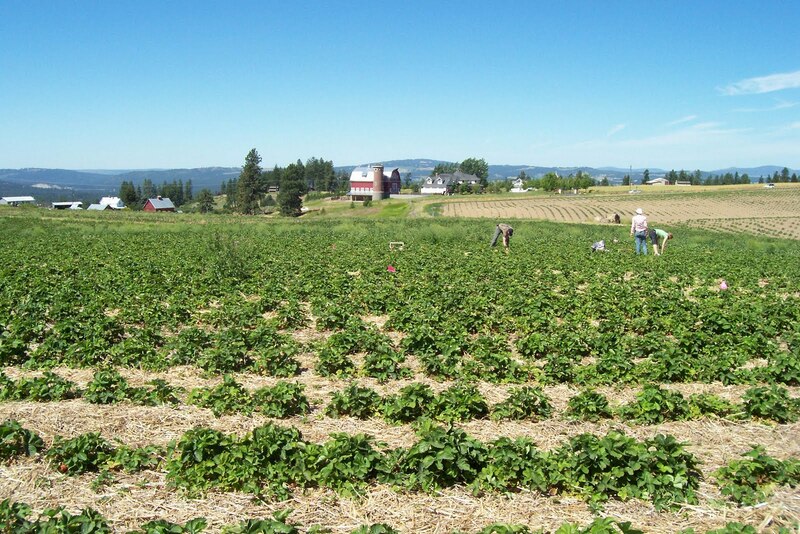 At once there would be the obvious theft of the strawberries themselves, but then there would also be betrayal of the trust that the farmers had placed in those that they let wander their fields. Farm life is different than urban life and trust works differently. It certainly is not something I would ever consider--stealing from a farmer. 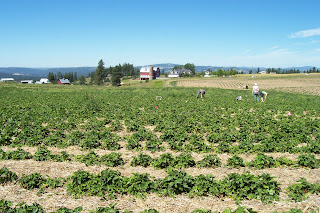 As I made may way to the area where they weigh the strawberries and you pay, I chatted briefly with someone who works there. She said the shade felt good, I said I had enjoyed being out in the sun. She said that there hadn't been a lot of sun this year yet and we spoke for a moment about the weather this spring and summer and how it had made things difficult for the farmers in the area. When I said I really felt for those who were trying to grow things this season she replied, "thanks, we are trying." 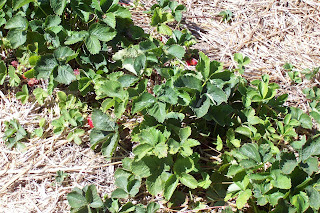 When picking strawberries I pick the ripest ones I can, they are often not the biggest. I think a lot of people must pick the big ones before they are really ripe so that they can have big ones. You also see a lot of oddly shaped ones that weren't picked and have gotten too ripe. But who is to say that those oddly shaped ones are perfect? They are literally the fruits of nature at work. That's perfect enough for me. I'll be eating fresh strawberries and baking with them for a while now, and will still have some to put up for the off-season. That way I can have some ethical berries for longer, making the ones in the stores in the winter that I know are not local a lot less tempting. This past week I spent two days in all day workshops offered by the university on a pressing university matter. I was pleasantly surprised at how well the meetings went. They had the potential for tedium and division, but they did not surface. This is an unusual thing for faculty to say about a summer meeting. Lunch however was a different thing altogether for eating ethically. Still from the University caterer, which is not the best at this, but by far not the worst either. 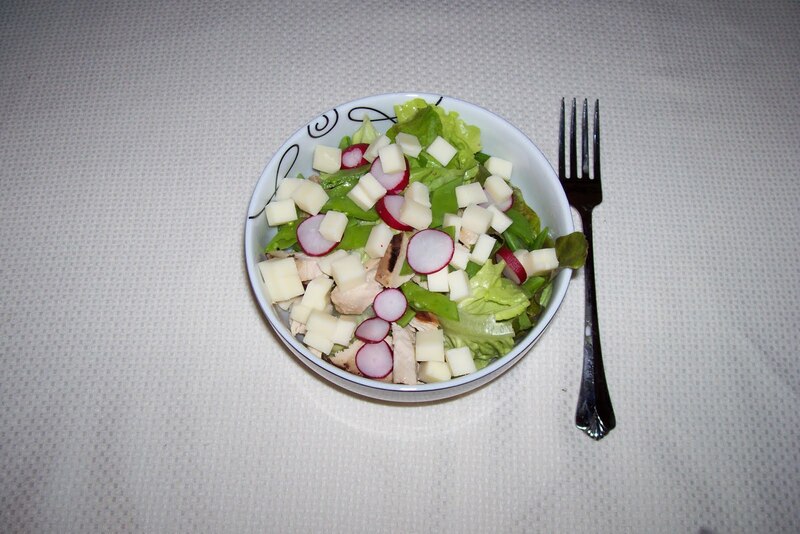 Each day there was a buffet dominated by a salad, which is at least a healthier option. On the first day there was grilled salmon as the protein available, which I skipped. I don't really like it and have no idea if it was wild or farmed. Even in the northwest there is no guarantee. Heck, there is no guarantee if unless you catch it yourself or take it to a lab to test for the dye they use to make farmed salmon pink. If Dean and De Luca got duped, I am sure others have been, too. The fresh fruit salad included things that were clearly not season or local (watermelon and pineapple) but I had some of that too. There were a couple more hours of meetings and then class for me to teach before getting home to eat something else. Second day may have even been more questionable than the first. Also, a buffet featuring a salad, but airline cut chicken stuffed with crab meat. When I sat down at the table without any chicken a friend asked if I was skipping it because it was unethical. Well, yes, at least in part. I am not crazy about crab meat either (I am not crazy about fish or seafood generally). I told her the chicken was no more questionable than the crab meat. But that I wasn't going to talk about why. It seemed inappropriate when the menu was limited and people had food on their plates. For lots of folks who travel for work and attend conferences, it is an excuse to eat food one wouldn't normally or to eat out for every meal. For some it is a minefield because of health concerns. For me, it has become a minefield because of ethics concerns. 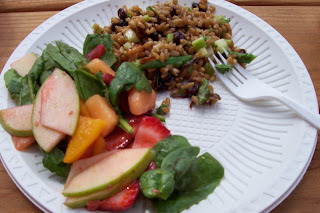 But this workshop at the University got me to thinking--I should know more about where the food comes from that is served on campus. I don't eat campus food every day, but often enough so I should know in order to make better choices. I know a little about it, but not a lot. Oddly enough, having dinner with a friend and colleague last night after the workshop the conversation turned to food and ethics (I love eating with people who share my food values--it is so much easier) and she mentioned working with the University dining services on a project a few years back and found it challenging because each side was using language differently--language like "local" and "sustainable." "Plant a radish, get a radish, never any doubt..."
So goes one of the songs from the musical, The Fantastiks. 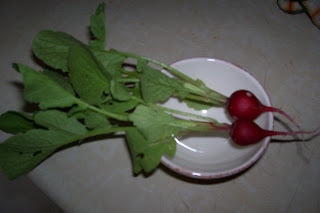 I finally found out what the mystery row of plants was in the garden -- radishes. I guess that is what we planted, since that is what we got. Radishes are not really my favorite, but I did eat the two home grown that were ready yesterday. I hadn't properly thinned the row since I could not remember what was in that row (I guess that is the result of planting a garden with someone else, I did not do all the planting, nor did I make all the decisions about what to plant). 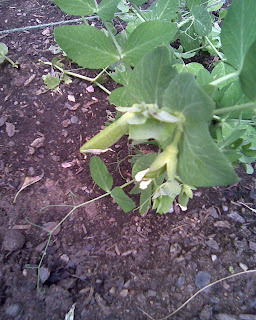 But, I hopefully will be able to harvest a few at a time and make some more room for the rest of them. Maybe it will keep the production a little more even rather than having a row of radishes ready all at one. If that happens, I certainly won't be eating them all, they will be parceled out. I do remember planting radishes as a kid -- they grew fast, so we kids liked them. Well, we liked to watch them grow and harvest them a little more than we liked eating them. Radishes always seemed to be the vegetable on the holiday relish tray that were left over (unless my Uncle Jim was at the festivities--he seems to be the one who liked radishes). When I was older I liked peeling the red ones into little roses, but that was the extent to which I liked them. Usually we planted the icicle variety when there were radishes in the garden. These radishes, though, are standard, red radishes, fairly mild. I added them to my salad at lunch today without even carving them into roses. And I liked them. It's probably been years since I have intentionally eaten a radish and growing them seemed to give me a good excuse to try them again. A good reminder to try things you think you don't like every once in a while--you might surprise yourself. I sure did. And that's a good lesson, even for those of us who are no longer kids and think our tastes have settled. Trying something different, even if not new is a good thing. It's especially important when trying to eat ethically since there might be local varieties to try or things that were once part of our diet that we are trying to replace with a better, more ethical, alternative. I still sometimes say "garden variety" when I mean "ordinary." A lot of people do. The expression must come from the days when everyone had a garden and when if you wanted something special, you weren't growing it yourself. Seems like things have come full circle. We now talk "heirloom varieties" when talking about the garden instead -- something special, old, not new-fangled, and not something you are likely to get in the grocery store. Maybe "garden variety" shouldn't be an insult anymore. If something is garden variety and actually from someone's garden these days it is to be prized, someone's care and attention went into producing it. It is not something to be dismissed. And when it comes to eating ethically, a garden variety is likely the better choice. We can know more about it and knowledge is power. Here are some of my "garden varieties." Peppers, yellow squash, lettuce and peas. I will never think of them as lowly again--and I won't compare them with the ordinary. And when these get a little bigger and ready to harvest, it will surely be some ethical eating! This summer, as I have for two other summers (last summer and two before that) I have been teaching an ethics of eating course. It is a course of my own design and making, prompted by a budding local food movement, looking for a topic that would encourage students to live their values, and a university freshman class reading assignment of Michael Pollan's The Omnivore's Dilemma. Two weeks into the third time around and things are looking interesting in the class as always. There are always varied students in the class. Some are there to fulfill a requirement, some are there because the topic was interesting to them. Some are there because they think I'm funny in class. I have a hunter, a vegan, a kid whose grandfather raised hens for eggs, some environmentalists and some whose positions are not yet clear to me. This is a philosophy class in applied ethics, cross-listed with environmental studies. Yesterday while teaching a desperate photographer from University Relations came in to get some new shots of classes being taught. In-the-classroom classes are few and far between in the summers. As I was teaching and he was snapping shots of the powerpoint slide and the board, I was wondering what someone would think if they saw these shots -- likely not that it was a philosophy class. The powerpoint slide told a tale about Monsanto's Round-up Ready Soy and had a picture of a soy plant damaged by Round-up, the white board had just a few things written on it in red ink--Bt corn and Bt soy.We were discussing a chapter from Vandana Shiva's Stolen Harvest where she deals with a series of what she calls myths about big agribusiness and GMOs. Why is this philosophy? Well, because philosophy includes ethics. Talking about this allows students to put their values to work in their own lives. That's really the goal of this class. Students want to live their values and they have to do that by their choices and we make a lot of choices about our food, but do so wildly disconnected from information about it or the values we say we hold. Perhaps the first thing to do when trying to eat ethically is to make clear what values we have and which ones relate to our food choices. Next is to arm ourselves with information and work on combining that information with our values. Priorities of values and information will change, so this is an ongoing thing. 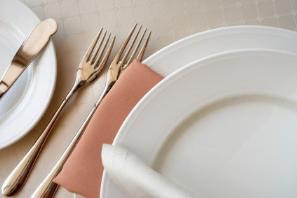 So those who want to live their values by eating with them will be armed with more than fork and spoon, but with pencil, pen, computer and library card as learning and taking notes are just as important. This is the first, small, green tomato in the garden this summer. 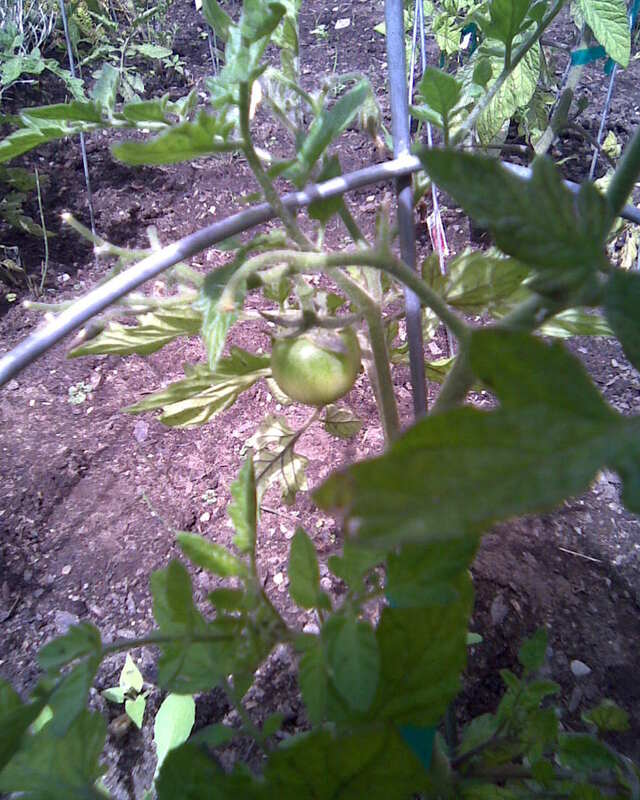 It isn't much to look at right now, but some day it will be a beautiful ripe tomato. And there is nothing better than a garden rip tomato eaten right in the garden. I can't wait! This is the joy of growing one's own! 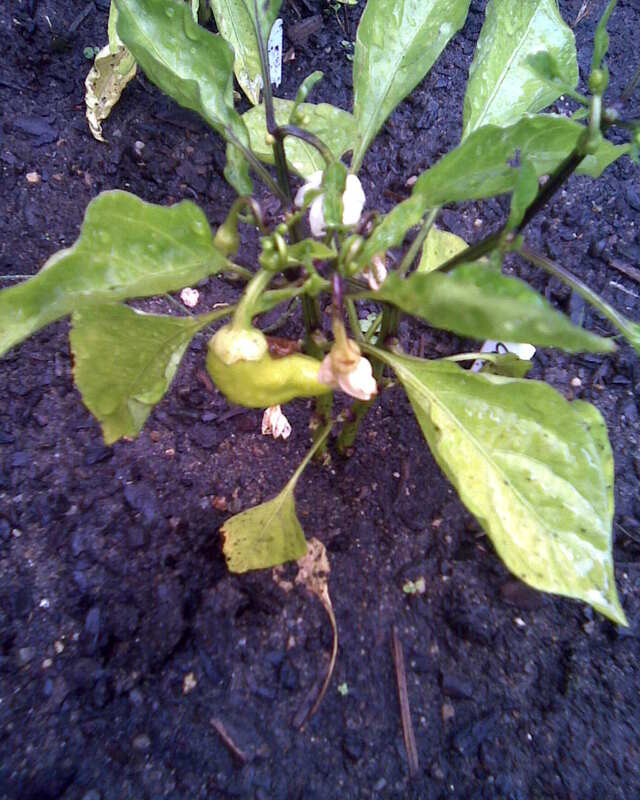 I know where the organic start came from (Main Market Co-op), I know who planted it into the ground (I did), I know who tied it into its cage (I did), I know who watered it (I did as well as some student helpers), and I know who will be there when it gets picked -- I will. Can't get more local than that! 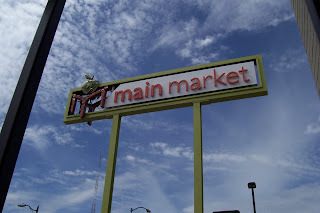 I just love Spokane's new food co-op--the Main Market Co-op. One of the things I like the most about it is the excellent selection of healthy, local, sustainable prepared salads and sandwiches at the deli/take-out area. Now that the weather is good, there are four tables outside to eat at and the larger, communal table inside. But here's the thing, yesterday, when having lunch at the co-op with a friend, we sat outside. While I was waiting for her to come out I wondered if the level of comfort people had developed from eating together at the communal table would be affected with the four picnic tables. Color me thrilled when two women asked to join us at our table. I had the faro salad which is a new favorite, a fruit salad with spinach, a scone and an all natural, cane sugar sweetened gingerale. It was a good lunch. The prepared salads are made right there in the real kitchen in the store by real chefs. I can feel good about this food. Another thing I like about the co-op i s that they share a lot of the same values about food as I do. So, it is easy for me to shop there. They do a lot of the thinking for me. I still read labels, but have less to worry about. Nothing in the place has high fructose corn syrup for example. Lots and lots is local or bio-regional, including much of the bulk food section (including flour) and there are a whole host of local producers that are members of the co-op sharing a stake in the store. Having a co-op or another store that has similar food values as you do is a great way of making it easier to eat more ethically. It cuts down on confusion. And if it is a co-op and you join as a member owner, then you have some clout when making suggestions. A place where local producers know their products will be show-cased is good for the local economy as well and gives those producers another venue to sell their products -- be it produce, meat, cheese, milk or eggs. This past spring at the MMC's first real member meeting we had a chance to hear from a local egg producer. A question was raised about the co-op's location -- it is very close to the downtown farmers market and the off-season farmers market. This egg farmer said that he was happy to have the Main Market right where it is--he has another place to sell his eggs reliably and it meant something to him that there was a store wanting to stock the kinds of food he thinks are important and that they were able to pay him a fair price. He even teared up a bit. Let me tell you, seeing an older man, who works hard on the land, tear up in front of a bunch of city-slickers at the co-op meeting is something I will not soon forget. He was encouraged by the people at the meeting, taking an interest in what he does and wanting to make sure that the co-op was not hurting his livelihood. This was justice in action. This is the hard story to tell about eating ethically. We have few like him left. To have a sustainable, ethical, and secure food system we need to have more of these small producers and more places in more cities like the co-op to bring the small producers usually superior products to those who want them and will pay the premium for them. It is encouraging to me that over 500 food co-ops opened in America last year. I just hope some of them have the ethical values our little own Main Market Co-op in Spokane has.